Do you have limited space, but need both a guest bedroom that can accommodate family or friends during the holidays or summers, plus a home office or living space for yourself during the rest of the year? 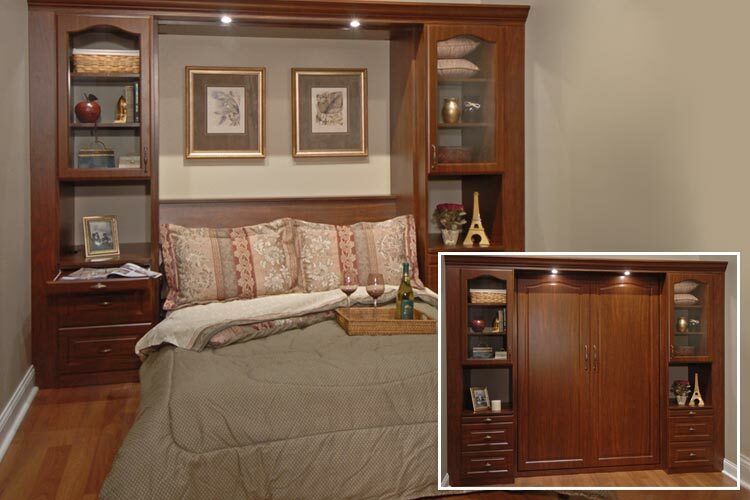 Both of these needs can be satisfied with a single room when a Closet Works wall bed is designed into the solution. 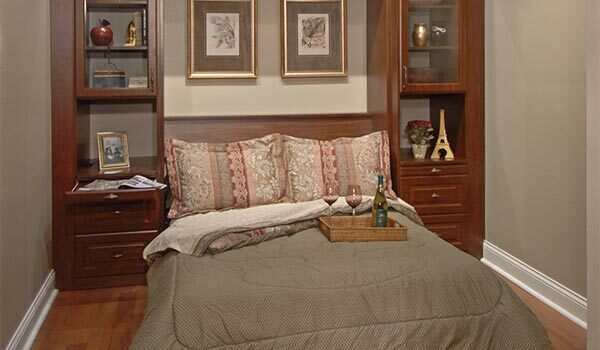 A Closet Works wall bed is like a Murphy bed with additional storage in a surrounding wall unit. 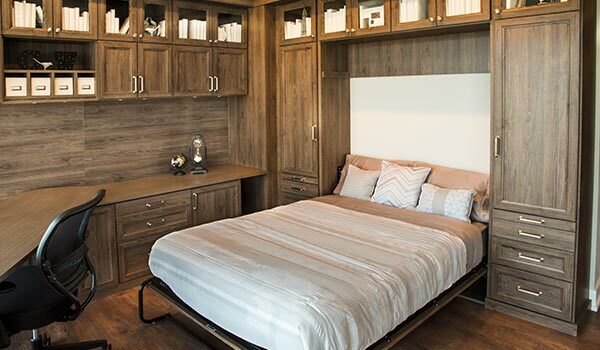 Whether you are looking to get the most out of a small square footage apartment, or creating flexible space in a home, our wall bed solutions can make all the difference between a space that works for you, versus one that is inconvenient and disfunctional. Existing square footage will do double duty when the space turns into a bedroom within moments — simply and easily without struggling to unfold a sofa bed or blow up an air mattress. They work great in child's bedroom to accommodate sleepovers, but fold neatly away to provide a bigger play area when not needed. Add one to a small studio apartment and you suddenly have an extra room. The possibilities are as endless as the custom configurations available. 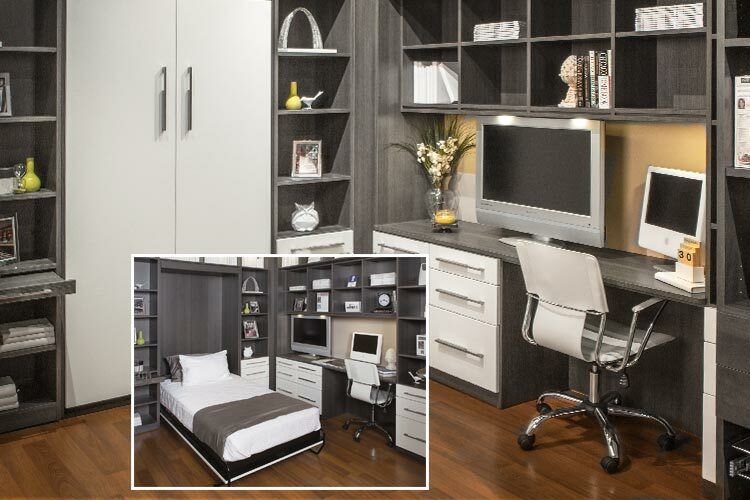 Our wall beds can be ordered with vertical or horizontal orientation, yielding slightly different dimensions. 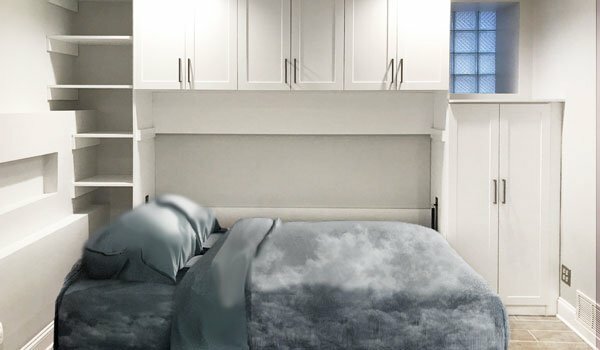 All Closet Works wall beds incorporate a high quality European style slat wood support system, similar in function to a traditional box spring but with a smaller footprint, and are extremely comfortable and durable. 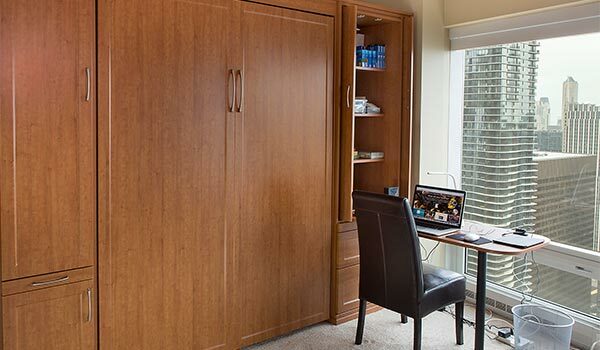 The Closet Works Murphy bed is easy and convenient to operate. You will get many years of good sleep from a Closet Works wall bed, even if used on a daily basis. 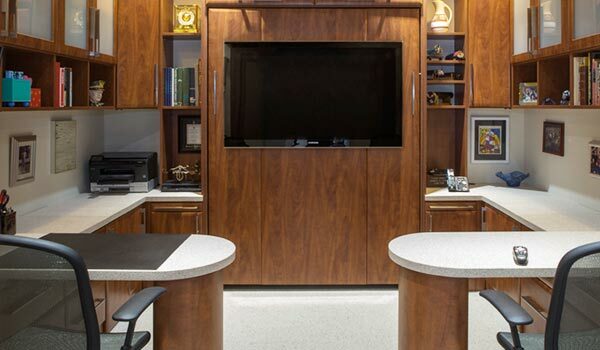 It can be built to stand alone like a Murphy bed, but is more commonly incorporated into a custom storage system, handling office equipment, media components or any storage needed. 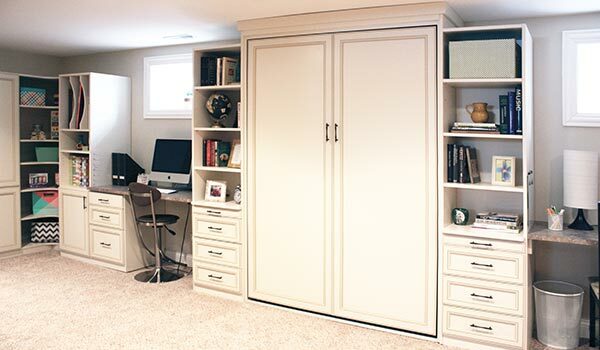 Add closet space by including wardrobes on either side of your bed. Many customers do a wrap around desk with pull-out tables. This is a long-lasting, comfortable and attractive solution suitable for any room in your home. Project Gallery of dual purpose Murphy beds (also spelled Murphey beds): Click on any photo to enlarge and view details of our Closet Works wall beds. 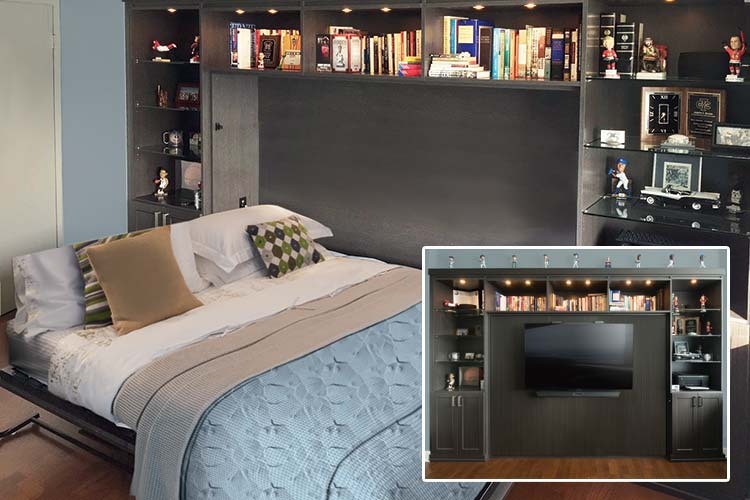 Wall Beds, Murphy Beds and Murphey Beds — What's the Difference? All three of these terms refer to a hidden bed that is stored in an upright position within a cabinet or closet. 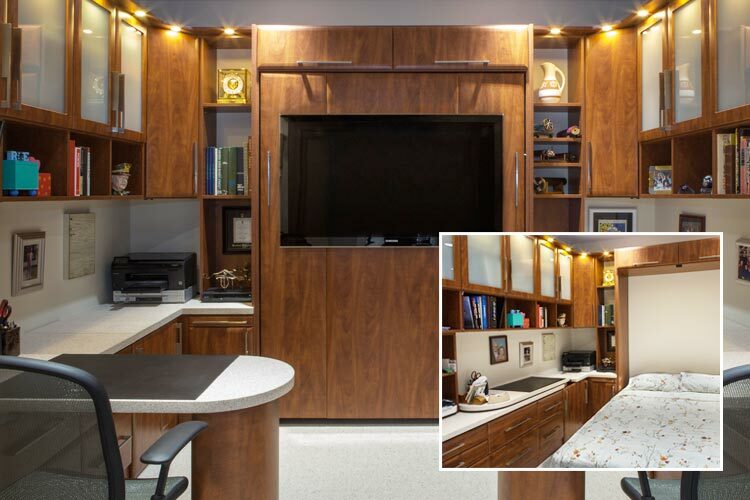 The cabinet can be a simple box, closet, or a more elaborate wall unit system that is usually anchored in some way to the wall. The backside of the bed is covered by a panel to match the cabinet or wall, rendering it's function invisible to the casual observer when closed. The bed is opened by pulling on a handle attached to the top of the panel, lowering it into a horizontal position for use. Legs fold down on one side of the bed for support. The other side remains attached to the cabinet. The term "Murphy bed" is named for William Lawrence Murphy, the bed's inventor who patented the innovative design during the early 1900's. His pivot and counterbalance system gave hidden fold down beds dependability and ease of operation. 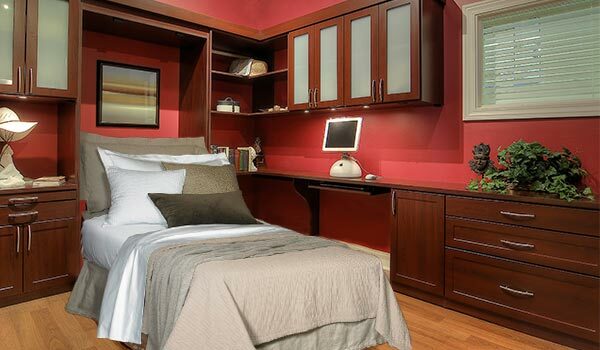 He founded the Murphy Bed Co. to manufacture his beds, which is still in operation today. 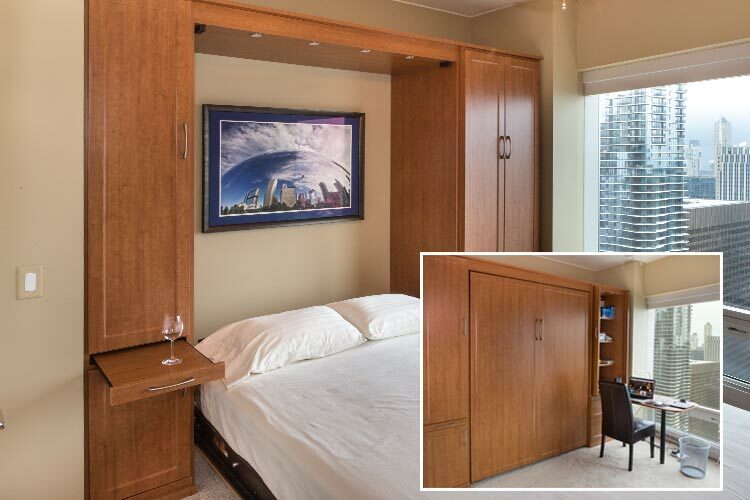 However, in 1989 the United States Courts ruled that the term "Murphy Bed" had entered common usage so thoroughly that it was no longer eligible for trademark protection. There are now many manufacturers who make a similar high quality product. The generic term for all of these beds is "wall bed" because of the way they fold out of the wall. 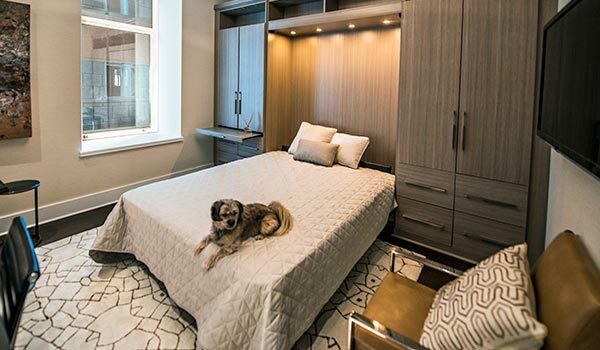 The term Murphy bed (sometimes spelled Murphey bed) specifically refers to a bed made by the Murphy bed Company, but many people now refer to all wall beds as Murphy beds. 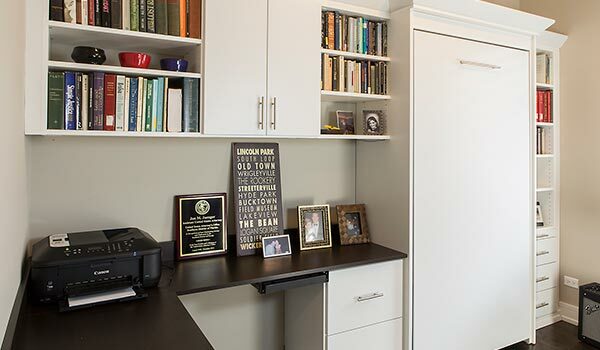 The Closet Works Murphy bed is a high quality wall bed that incorporates the same conveniences of the original Murphy bed, but we take it a step further by including more elaborate cabinets and wall units to surround the bed for storage. We use a piston system rather than springs to raise and lower the bed. Similar in concept, our disappearing Murphy tables are also popular. We make two versions of both the beds and the tables, depending on whether your available space for storage is horizontal or vertical.